Would you want to become a witch if it offered a bunch of cool spells but on the small text there’s something about a third eye in your forehead? Maybe, maybe not? In any case, the Hundred Knight is back so you don’t have to worry about any of that. 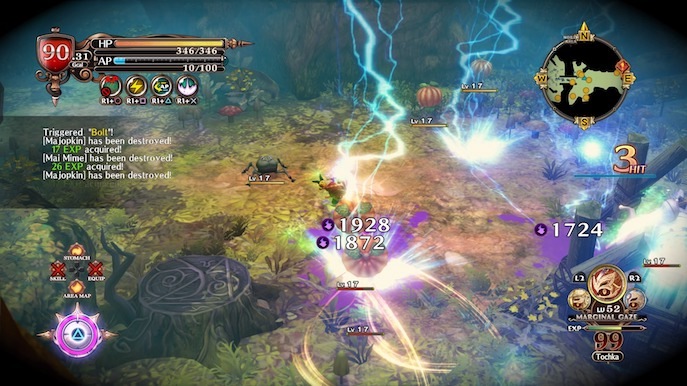 Grab your favorite weapons because Nippon Ichi Software and NIS America have brought us The Witch and the Hundred Knight 2, the top-down isometric singleplayer is back with more hacking, slashing, and a buttload of shenanigans. Now available on PS4 in Japan, America and Europe. WHAT IS THIS EVEN ABOUT?! Hold your horses, a brief synopsis; Kevala, a world where witches have humanity on their knees and make them tremble in fear, one would think there is no changing this sort of lifestyle, that there is no hope nor any meaning but to surrender and just obey your overlords. Fortunately, an anti-witch organization called the Weisser Ritter (WR) has set their goals in stone to protect the downtrodden from the evil magic that witches cast on their land and fight the witch disease (“hexensyndrome”) which only affects young girls giving them a third eye in their forehead from which will eventually open and turn the girl into an awakened with fearful powers. In this story, you follow Amalie and her younger sister Milm. They both contracted the disease at a young age, however, Amalie set to the WR headquarters for aid. Amalie was healed but her sister’s third eye awakened before they could heal her, and so Chelka the witch was born as well as her manania the Hundred Knight (created from Milm’s favorite puppet). The entire aim of this story, or rather Amalie’s, is to bring back her sister Milm from the new body owner Chelka, whatever it takes. Amalie is an apprentice Holy Valkyrie at the WR, studying to cure hexensyndrome, but must live with the secret that her sister’s body now belongs to a witch. In your adventures you will encounter friends who will aid you and eventually you will be enjoying a cast that could easily star in a sitcom. You follow this entire plot through a hybrid of visual novel animated character interactions and third person 3D action RPG controlling the Hundred Knight, a knight of a hundred tactics, known for his skill at learning and adapting to the enemies’ weaknesses and overcoming any obstacle or foe. 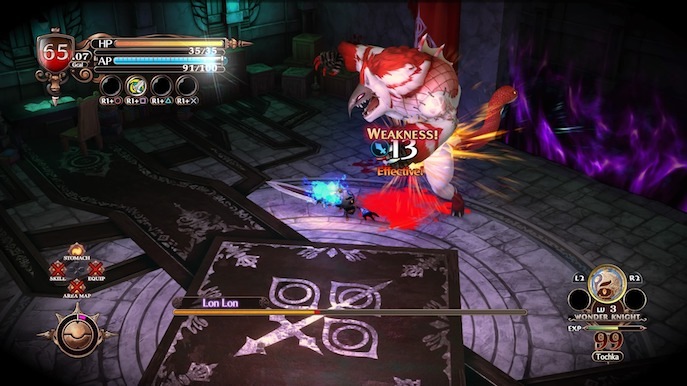 The Hundred Knight features a unique set of gameplay mechanics in which you hack and slash enemies, they drop loot and weapons and you can equip them. WHAT’S SO UNIQUE ABOUT THAT? It just so happens the Hundred Knight can do a 5 hit combo, in which each hit can be done by a different weapon, be it a sword, lance, hammer, staff, lance or spear. Meaning you can combine whatever sort of loadout you want and make them shine during combat. 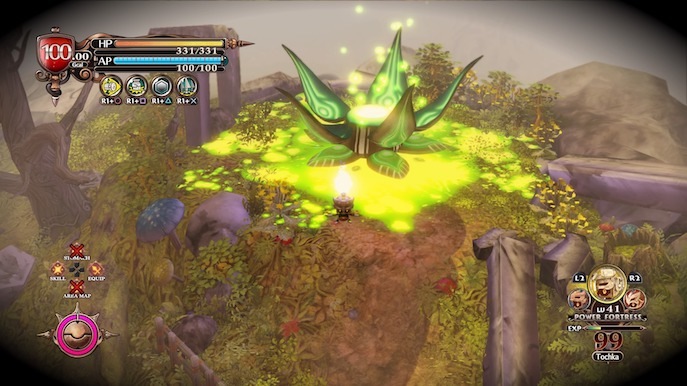 As you power through waves of creatures, exploring map zones wherever the plot takes you, the Hundred Knight will gain experience and level up, gaining skill points which can be used to unlock and strengthen special abilities both active (by pressing R1+Circle, Square, Triangle or X) and passive (which are always ON). You can also unlock Tochkas which are these void creatures that help you battles, and can also be leveled up. As for the weapons you loot during your adventures, the more you progress through the story, the higher the weapon ranks you will find. If you have a lot of junk or weapons and armor you won’t use, you can go to the base camp (The Durga Castle, home of Amalie and Milm/Chelka) and use the Krafting menu to imbue this junk into your favorite weapons and level them up! Making them stronger or enhancing their ailment effects like stunning, charming, poisoning or sleeping. If that isn’t enough, the Hundred Knight has 6 different Facets, each unlocked after progressing enough through the story, and each having special stat bonuses depending on the weapons you use. You can switch between these Facets at the Durga Castle and equip whatever loadout you want for each, but you can only take 3 Facets to your explorations and missions. When you’re out in the field, you can fight enemies and switch between the 3 Facets mid-fight to experiment different attack rotations depending on the enemy weaknesses. 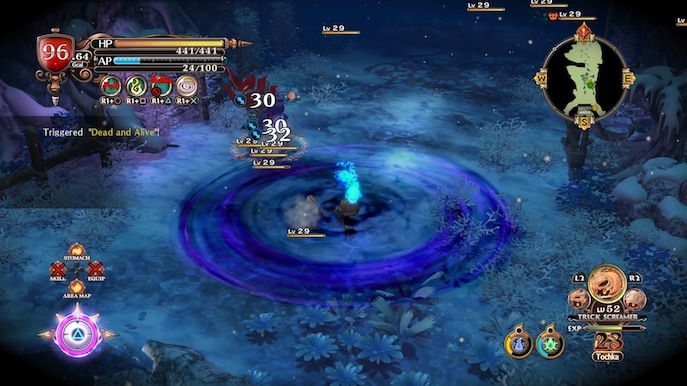 Monsters will either be strong or weak against different types of weapons or attacks that you land on them, allowing the player to step out of their comfort zone and really make the best out of the versatile way the Hundred Knight plays. Eventually you will encounter a zone boss which you will have to study and try out which weapons do the best effect on it, and by winning you will obviously progress the story through its Chapters, unlocking new territories, enemies and better loot. HOW DOES THIS GAME DIFFER FROM THE FIRST TITLE IN THE SERIES? In the first game, the Hundred Knight didn’t have the luxury of active abilities, making your gameplay depend only on the Facet loadouts and consequentially becoming monotonous. 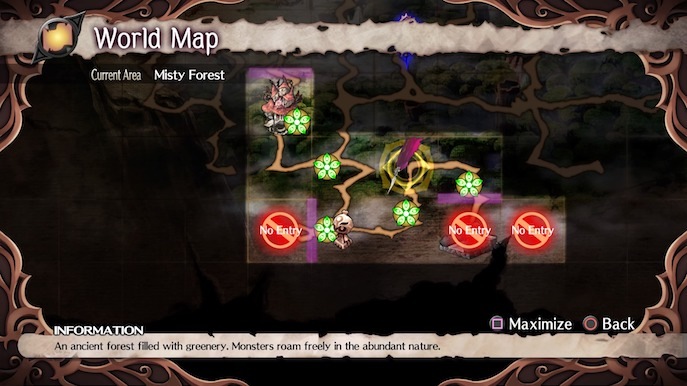 The map was discovered by percentages and there wasn’t really any roads you could follow to know exactly where to jump to, you simply just played until you unlocked the next zones. In the sequel you have a better understanding of where you are with coordinates and roads, as well as knowing where you can and can’t go and greatly illustrating the ecosystems. Now you can also rotate the camera during your quests and find hidden loot chests behind obstacles, this at first was slightly disorienting specially with the mini-map flipping around but you get used to it. The first game you could easily switch weapons to their higher rank versions and blaze through the story and hack and slash everything, while in this sequel monsters are much more resilient to their defenses against specific weapons, forcing you to either play around them or skip them entirely. Bosses where a joke as you could just smack them for 20% of their health with a high rank hammer, while in this new installment they have a bunch more health, deal much more damage and makes you want to analyze the fight accordingly. However not all bosses in the sequel get the “fun” gimmick; while some made the fights intense, challenging and entertaining, others were simply repetitive, predictable and eventually boring damage sponges. Both games share quite a few of assets, especially in the mananias department, you will see a lot of familiar monsters with the exact same attack animations and AI patterns, but also a good few of new designs with creative gimmicks. In terms of gameplay “thinking outside of the box”, the sequel lacks a lot that made the first game more challenging than just a hack and slash. Where are the teleporting puzzles? Why are zones so linear even though they are random every time you enter one? The story clearly demonstrates a safe way of play through with the same pattern of exploring, cutscene, exploring, boss, cutscene. On a personal note, while this sequel made a lot of changes to the gameplay, I feel they made the game much more simpler to understand and more intuitive. This is a huge perk, allowing it to be more accessible and entertaining. However, one thing that I really enjoyed about its predecessor was the mysticism in the core gameplay, it was mysterious and had unorthodox game design, making it very unique and mischievous like the whole tone it was setting in the art and music departments. The sequel only seems to suffer from a lack of this only on a gameplay aspect which is not entirely vital, but it did lose some of it’s fantastic personality. The story in this sequel while being interesting, it does stumble here and there. It sets out a great intro and then manages to keep it sustained with the whole “Amalie keeping up an entangling lie”, but then you get Chapters where you ask yourself in front of the screen “Why are these characters doing these decisions again? For what purpose other than sidetracking?”, the plot seems to have Chapters that feel out of track for good reason, to the point where the story only got moving and much better by the last two Chapters and of course the Epilogue. The characters for the most part were written with interesting aspects. It’s a shame however that Amalie is portrayed as such a weak individual in the combat scene, but I suppose it contrasts with her strong will and determination. As for Chelka, we get a great substitute for Metallia, just as badass, full of herself and yet being kept in check by Milm. And instead of Arlecchinno, we have a drag queen magic-created-giant-raven named Hunninmuggin to play as the butler. The Japanese voice acting cast is of course pretty entertaining, while the English cast is for the most part pretty good, specially Hunninmuggin, there were only very few characters whose voices just went too much and swayed away from the game’s actual tone. There is some degree of disappointment as to how this sequel didn’t really have any connection to the events of the first game. 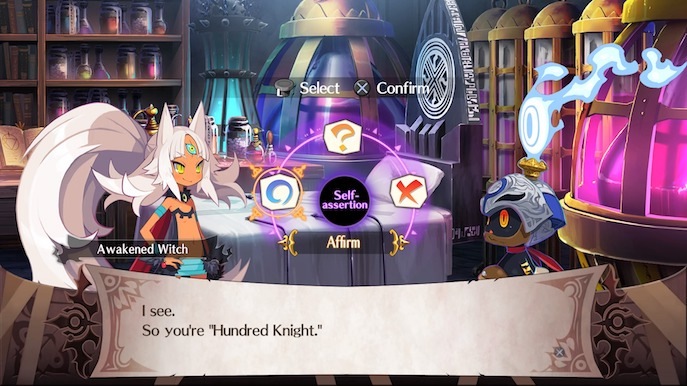 While I do tolerate and respect the idea of creating a whole new setting, the only connection we have is literally the Hundred Knight which I’m not even sure if he’s even the same one we play as in the first game. Even the witches are like a whole new species or generation. I’d assume it’s been a very VERY long time, to the point where Hundred Knight is a hero from a children story to go to bed. 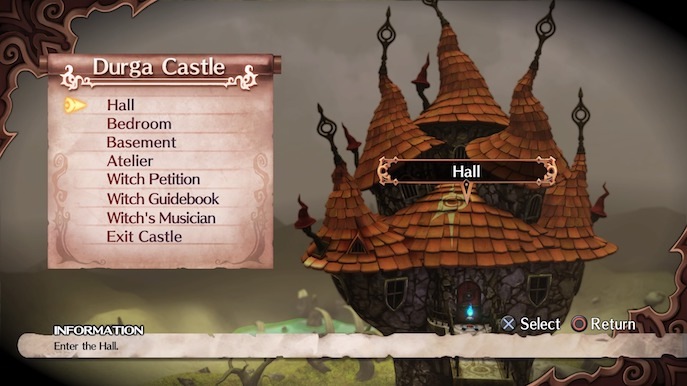 We also have the option to listen to a DLC music track about Metallia, and that’s about it. Again, it’s not a forced decision and not every sequel has to be an immediate scene from the last, I simply feel that it would have had maybe a couple or more easter eggs here and there. THE VISUALS, THE MUSIC, TELL. US. MOOORE! Ok, you need to calm down over there. The franchise features one of the most unique anime-style versions and illustrations of characters, giving them a lot of personality and feel to their likeness. Desinger Takehito Harada has been very talented when it comes to these games and the Disgaea series, specially by making the female characters pop up so much with their extravagant hairstyles, making them much more memorable and fantastic. The scenery in the game as well as the UI and the mildly alarming yet fascinating soundtrack is well illustrated to go with the tone of the game, there’s nothing that looks or hears out of place, visually and musically it is simply a remarkable aesthetic that many other hybrid Visual Novel action RPGs should take not on. 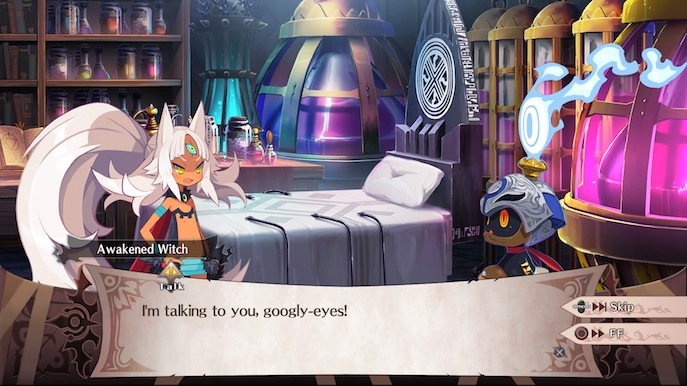 The Witch and the Hundred Knight 2 can be played immediately, without having to indulge into its younger brother, however it is recommended to do as the first game’s Revival Edition features a lot more gameplay options, but whether or not this new installment lacks some fun content, it definitely is a must play for fans of the series and/or people who enjoy a good hack and slash with a dark sense of humor.